The first few pages were interesting. That’s what the first few pages were. The rest of part one was a veritable bore, in spite of the chopped up narrative, never living up to what seemed to be its promise. Most memorable was the misspelling of rijsttafel as rijstaffel. Was it on purpose? Does it mean anything? Does a rice table undermine the grand narrative in ways the rest of the book tries but fails? Part two and three decided to change into something akin to a normal narrative, but that didn’t improve the book any. Still, at least my enjoyment of the book oscillated by this point, perhaps even with a vaguely upward trend. In the end, Democracy is a quick, boring read with a mildly interesting ironic narrative gimmick. The constant false starts and repetitions are presumably meant to undermine the grand narratives of modernity, those of the American democracy in particular. Instead we get a dull soap opera with lifeless characters dressed up in a thin veneer of literary play. Joan Didion (1984), Democracy . I first came across Toni Morrison a few years ago when I read Beloved , a book that positively blew me away. Although I haven’t read anything else by her since, picking up Home when I noticed it on sale was a no-brainer. I didn’t realize my copy of the book came out of the printer’s cut crooked, but I think it adds to the experience. This book definitely succeeded in shocking me, someone who considers themselves a fairly well-informed European Americanophile. While I’ve read non-fiction literature like the maddeningly complacent Up From Slavery by Booker T. Washinton as well as Letter from Birmingham Jail by Martin Luther King, it still failed to register with me just how persistent such attitudes were across the entire country. Segregation was not just a southern thing. This isn’t something I grasped from, say, Pynchon’s V. , which I’d argue draws attention away from the racial and social problems in order to focus on some kind of crisis of modernity. I bring this up because the PTSD-suffering protagonist sees “black flames shooting out of the V” of the logo of a Chevron station. Morrison clearly isn’t Pynchon, but when your nose is singing from being pushed into flamey V-related imagery you can’t help but make a connection. The interaction between the global narrator and the Frank narrator is interesting, but I shouldn’t spoil it. If you’ve read Beloved you kind of know the shtick, but it’s different enough not to feel like repetition. In brief, Home is a story of broken people jerkily healing themselves, overcoming not only their shattered selves but also the malfunctioning society that made them. Recommended. 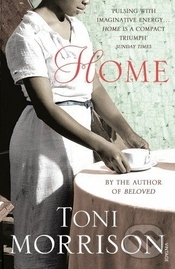 Toni Morrison (2012), Home .